Lower back pain is the most common complaint of the golfing athlete. It is the most cited reason for why people stop playing due to injury, and over 25% of golfers surveyed in one study reported that they experienced lower back pain after playing 1 round! Golf is supposed to be fun, not painful! In many cases however, it is preventable. Many amateur golfers lack thoracic (mid-back) and hip rotation necessary to make a full swing at the ball. 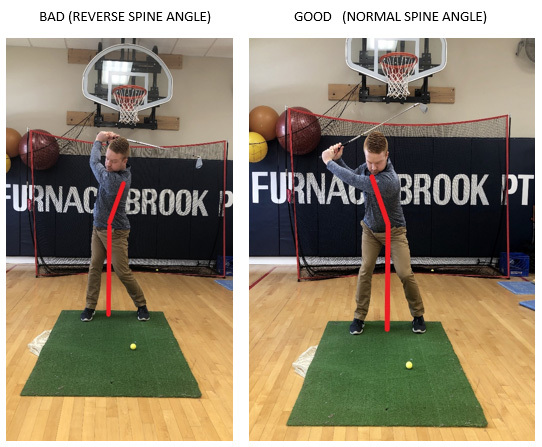 In particular, I think this influences the New England golfer moreso, as our bodies have suffered from a long, cold winter and heavy snow removal (coupled with some extra couch time) that can cause stiffness and tightness within the hips and thoracic spine. When these joints get stiff, the average golfer will commonly compensate through their lower back. This causes them to generate too much rotation through the lumbar spine, a region of the body not meant for rotational energy and forces, and cause too much shear force and torque, leading to injury. I just want to take a moment to address 2 very common (and preventable) findings within the golf swing that directly contribute to this injury: S posture and Reverse Spine Angle. S Posture is simply defined as excess lumbar extension or lordosis as golfers address the ball. This places the pelvis in an anterior pelvic tilt and the entire lower trunk into what’s known as lower crossed postural syndrome. Lower crossed syndrome puts the lower trunk into a significantly disadvantaged position for efficiency and performance. Within this position, the glutes and abdominals are inhibited, while the hip flexors shorten and lower back musculature gets put into overdrive. Essentially, your core shuts off and hangs your lower back out to the dry with no protection. At the very minimum, it is going to sap power and efficiency from the golf swing. At its worst, lower crossed postural syndrome is a recipe for disaster within the lumbar spine, and can lead to muscle, facet, and disc problems. 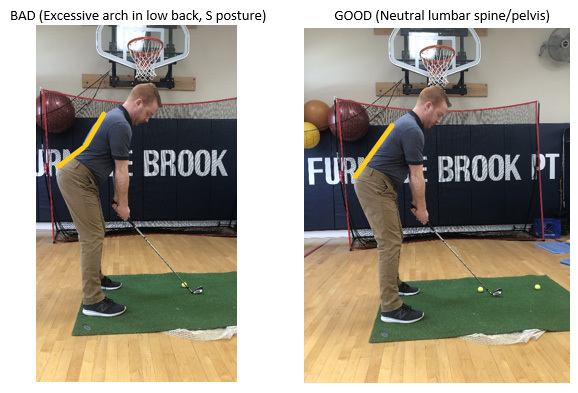 S posture is identified by looking down the line (behind the golfer looking at target) at a golfer at address and determining if there is an excessive arch in their lower back as they line up. You can identify it yourself by assuming a 5 iron address position in front of a full length mirror. If it is determined that you frequently encounter a reverse spine angle during your takeaway or at the top of your backswing, it is not a question of if you will experience lower back pain, as much as when you will experience lower back pain. Reverse spine angle occurs as a compensatory movement during the backswing of a golfer, causing the lumbar spine to shift from a neutral, slightly flexed position into a closed pack position of extension and sidebending. During the downswing, the lumbar spine shifts position again back into slight flexion as the clubhead nears impact. These quick changes in positioning of the lumbar spine while generating torque and rotary force will create large amounts of shear force on the intervertebral discs, as well as heavy loads on the facet joints. If these swing mechanics are not addressed and repeated over time, either the disc or the lumbar facet joint can suffer a traumatic injury as a result. If you’re currently experiencing lower back pain, don’t let it ruin your summer and sap all the fun from your golf game! As a TPI certified physical therapist, I’m specifically trained to identify and prevent these issues from causing you back pain. Give me a call at 617-770-4167 or email at rsheedy@furnacebrookpt.com to setup a 30min physical screening specifically engineered for the golfing athlete, completely free from now until Memorial Day 2019!